Photo albums for your children’s memories! 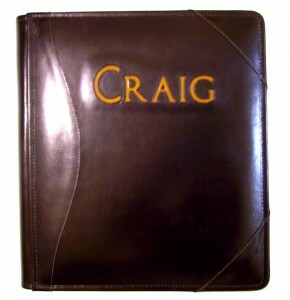 Powell leather photo albums make perfect back to school gifts for your children. Preserve memories of your child’s school days from Kindergarten to Graduation in a beautiful personalized leather photo album crafted exclusively to your specifications. Why store those precious memories in a box? Powell Leather will create a family keepsake built from the finest materials which will last for generations to come that can be beautifully displayed for years of enjoyment. You may add blank pages to journal, attach progress reports, special art projects, preserve and display achievement awards, or certificates and ribbons. Photos illustrating the anticipation of the first day of kindergarten all the way to the proud accomplishment of Graduation may be preserved within this beautiful portfolio’s pages. We will personalize your album with your child’s name, initials, or any design you wish upon the cover. Please contact us anytime you wish to discuss your special project.